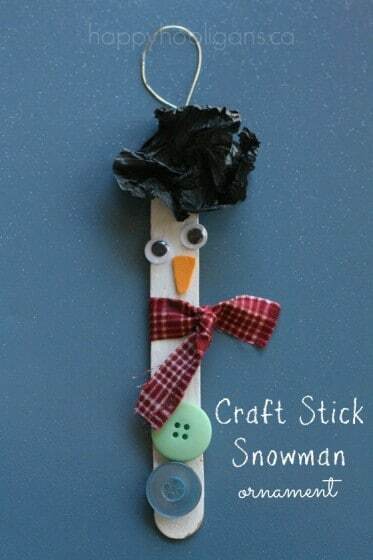 Kids of all ages will enjoy making these popsicle stick snowman ornaments for the Christmas tree. It’s a simple snowman craft that’s easy enough for preschoolers, but so cute that older kids will fall for it too! 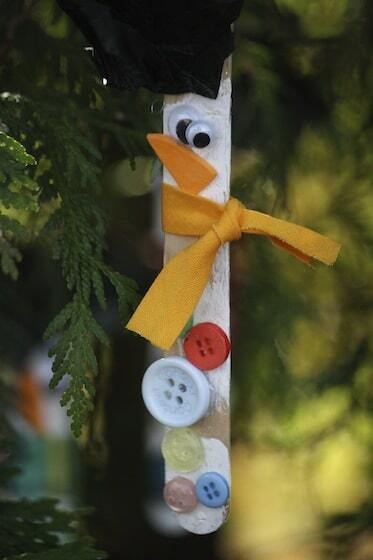 The hooligans have made a LOT of popsicle stick ornaments in my daycare over the years, and these simple snowmen ornaments are always a favourite. 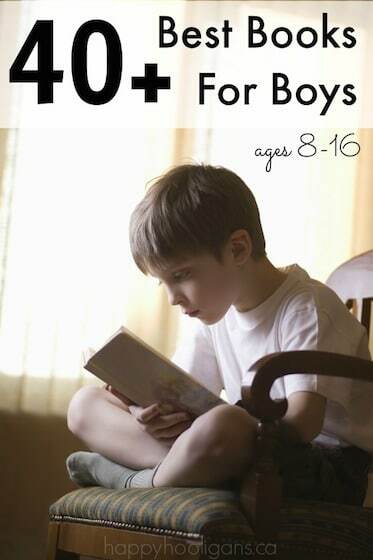 They’re easy for young children to make, and require just a few basic craft supplies that you already have around the house. 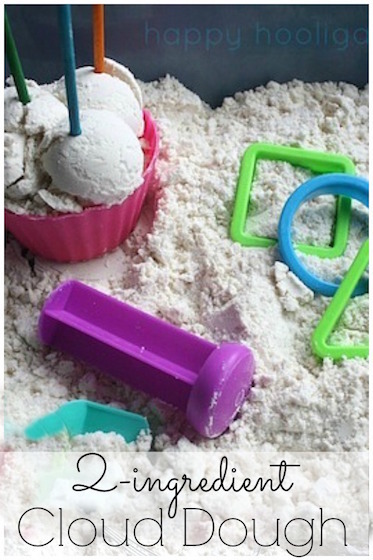 Using common household supplies and materials when you’re crafting with kids makes craft time easy, and keeps costs down. 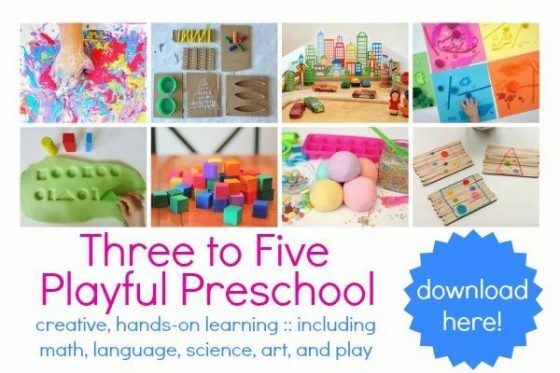 Produce trays, yogurt cups, stir sticks, plastic straws, cereal boxes, cardboard tubes, paper bags and tissue paper are all highly prized items here when it comes to craft-time. Keep your eyes open at thrift shops and second-hand stores for ribbons, buttons, yarn, beads, artificial flowers and fabric scraps. And before you throw something in the recycle bin, ask yourself if you can use it for crafting. 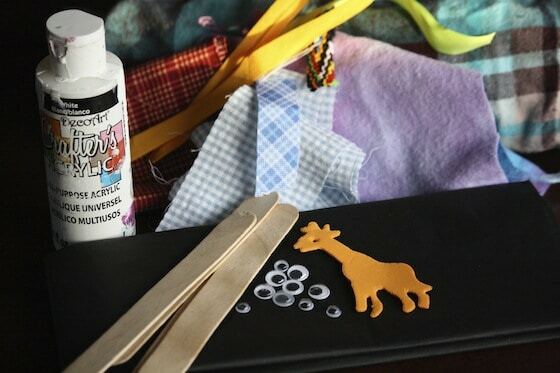 Use free or cheap essentials as the “bones” for your kids’ craft projects, and visit the dollar store for a few key craft supplies like popsicle sticks, googly eyes, foam shapes, pompoms, gems, paints, glue and pipe cleaners, and you’ll be able to craft right along with us. Before we got started, the hooligans explored the fabric and ribbons, and examined the buttons and chose the ones they wanted for their snowmen. While I cut the fabric into strips for their snowmen’ scarves, the kids painted their popsicle sticks. There was a bit of a wait while the popsicle sticks dried, so they messed around in the buttons again, and then they spied the scissors in the craft bucket, and wanted to do some cutting. I gave them some thin strips of paper, and they worked on their scissor skills while I dried the popsicle sticks with a hair dryer. Before moving on to the next step, I tied the fabric scarves around the popsicle stick. A preschooler could likely do this herself, but my 2’s and just-turned 3’s haven’t mastered “tying” yet. With their scarves on, we were ready to decorate our snowmen. The hooligans glued buttons, googly eyes, carrot noses on their popsicle sticks. In hindsight the noses look more like duck beaks than carrots. You can cut your noses narrower than I cut mine. For the final touch – the hat! When I was planning this craft I was a little stumped about what to use for the snowman’s hat. But it eventually hit me – tissue paper. The hooligans glue crumpled up tissue paper the tops of their popsicle sticks. To finish, I used a glue gun to attached a loop of silver yarn to the back of each snowman. And that, my lovelies, is all there is to making our popsicle stick snowman ornaments! What do you think? This is great! I am trying something new in my kindergarten class on the lines of an economics unit/holiday workshop that a colleague introduced me to recently. 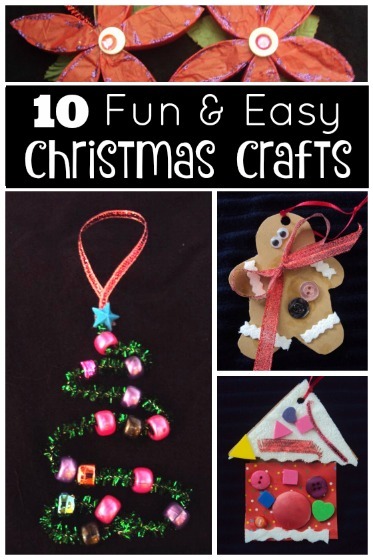 I have been looking for good ideas for easy crafts and this fits the bill beautifully. Thanks so much! 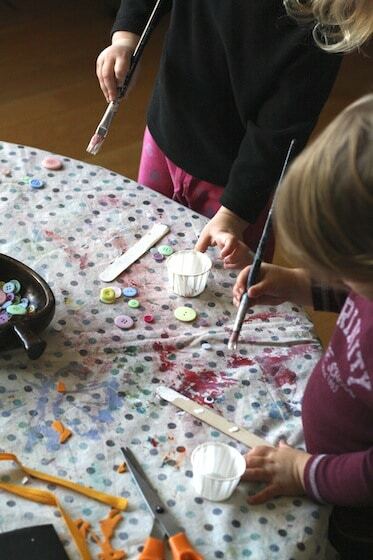 Popping over from The Multitasking Mummy…this activity will go great during our snowman theme week! 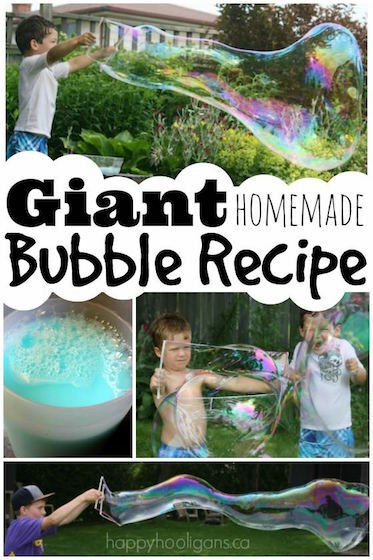 What a simple and fun activity! Those little scarves are hilarious! Thanks for sharing. These are just so adorable and yet so simple to make. So glad you found ours then! 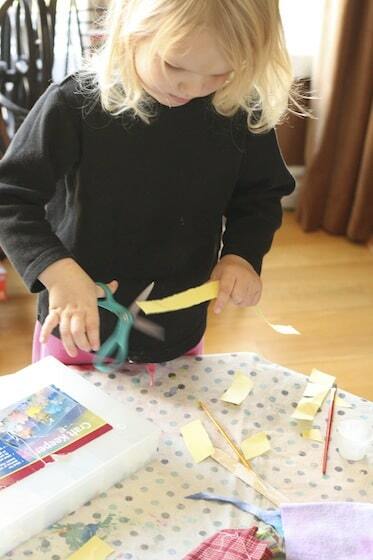 Have fun crafting with the grands! Yay! So glad we saved the day for you, Lauren! I love it when the Universe delivers exactly what’s needed like it did for you when you found us! The good old power of prayer! I’m so glad you’ll be following along with us now! We’ll have lots more to share before the holidays, so you’re in for some fun! You’re so welcome, Becky! Hope you guys have as much fun with your snowmen as we did! 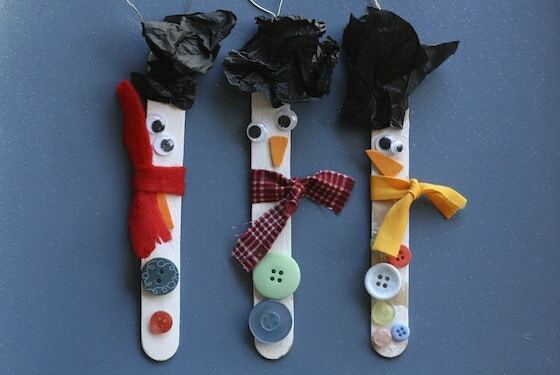 We started our holiday workshop this week and made the most adorable craft stick snowmen. The kids loved it and they did an awesome job! We used black foam for the hats. 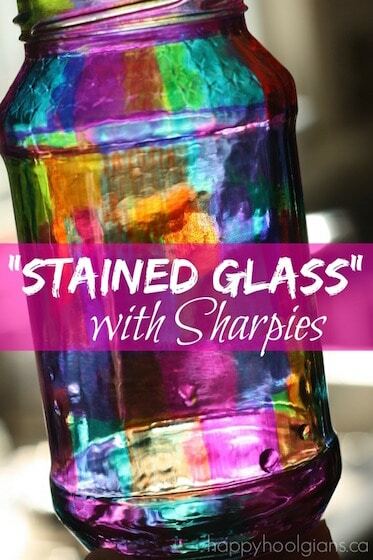 This is a great craft and I so appreciate your sharing the idea. 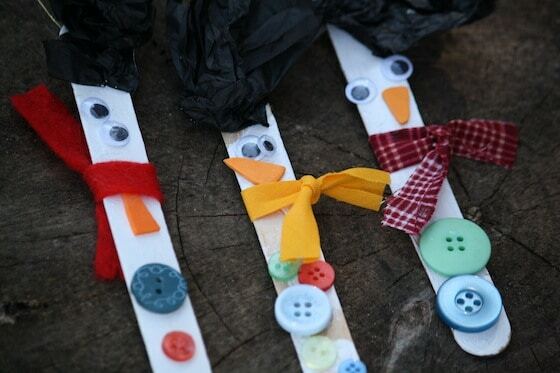 My colleague had her kids make the snowmen craft sticks as bookmarks – equally cute and fun, and she did the button wreaths as well, with great success. Happy Crafting Holidays! We made stick stocking name tags the other day. Wrote names with glue, glittered them and added a jingle bell or two and sparkly things to the ends. I taped them on our stocking holders. Super cute! We also made a Santa, Googlie eyed sticks and some with jingle bells all the way down to shake while we sing the song. I glued those that we didn’t put on the mantle to a green card stock paper and hung it on a window pane to catch our xmas tree lights. My three year old loved it! I’d upload a photo but don’t see that option here.